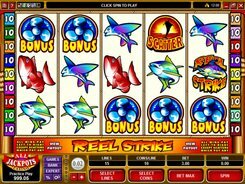 Reel Strike is a fishing-themed slot with 5 reels and 15 paylines. 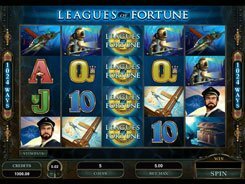 The game features a wild symbol, two scatters and free spins. 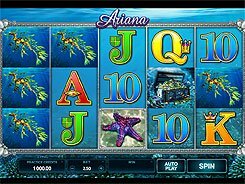 On the reels you will come across themed symbols including flying fish, a barracuda, a fishing reel, a boat, and other fishing-related icons. A coin size comes in a range of $0.01 to $0.5, with up to 10 coins placed per line. By adjusting the said betting options, you can wager anywhere from $0.01 to $75 per spin. 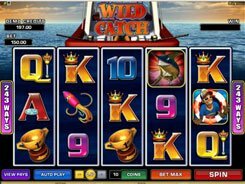 The first jackpot worth a massive $50,000 is awarded for hitting five wild symbols on a payline. 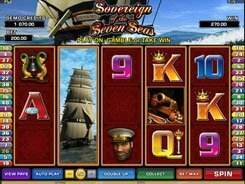 A free spins round is triggered by three or more Boat Prop Bonus symbols appeared on an active payline. 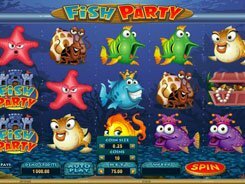 At the beginning of the feature, you have to choose 1 of 6 boats to determine the number of free spins (up to 7), and then another boat to win a multiplier (up to x6). The free spins feature cannot be retriggered during the free spins. 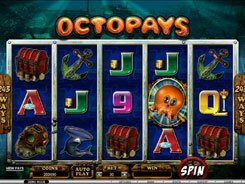 Another feature worth mentioning is that a wild can replace for the Boat Prop Bonus symbol, thus, increasing your chances for triggering a free spins round.